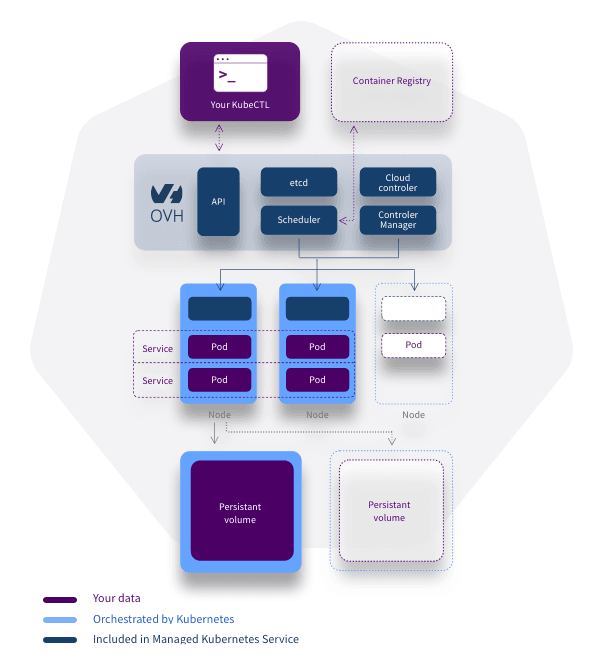 What can you achieve with the OVH Managed Kubernetes® service? Kubernetes® is the industry-standard container orchestrator, used by companies of all sizes. It makes it simple to deploy and scale highly reliable, highly available applications, even in hybrid or multi-cloud environments. The Managed Kubernetes® solution is powered by OVH's Public Cloud instances. With OVH Load Balancers and integrated additional disks, you can host all types of workloads while ensuring total reversibility. The solution’s internal components are deployed, hosted, monitored and maintained in optimal working condition by our teams, and updated for free. This allows you to focus on your business (containers and services), using the standard tools of the Kubernetes® ecosystem. You run a website based on two Docker images: one is for the database, the other is your web application. Your website receives a high volume of traffic and you need to ensure high availability. You also need to accommodate spikes in online traffic. To ensure high availability, you choose to distribute the web application on two worker nodes. The third hosts your database. This data is stored on a high-performance disk. To distribute web traffic between your worker nodes, you use an OVH Load Balancer. If you anticipate an increase in traffic during a specific period, you can adjust your platform accordingly. In case of peak traffic, you can (for example) move your database to a C2-15 instance, while keeping the aforementioned B2-7 servers to distribute your web service. With this configuration, you would add £27.70 to your usual pricing, based on per-hour billing (24 hours x 7 days x £0.1649/hour). OVH is a proud member of the CNCF, who have certified this solution. Want to learn more about Kubernetes®?